There is confusion over whether a shark which attacked four tourists off Egypt's Red Sea resort of Sharm el-Sheikh has been captured. An oceanic white tip shark injured three Russians and a Ukrainian earlier this week. Nearly all water sports have been halted at the resort. 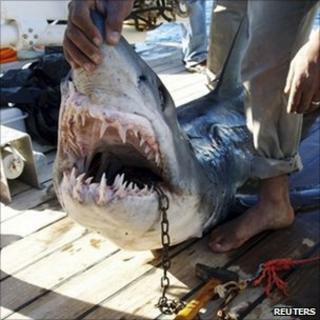 The Egyptian environment ministry said the shark was now being held at a national marine park in the area. But diving industry officials argued a different shark was behind the attacks. One of the victims lost a foot and another an arm in the attacks on Tuesday and Wednesday, reports say. One of the tourists is believed to be in a critical condition in hospital in Cairo. Sharm el-Sheikh is one of the most popular areas in the world for diving, so a decision to suspend water sports there would not have been taken lightly, the BBC's Jon Leyne in Cairo says. The Egyptian environment ministry said in a statement on Thursday that the shark had been captured and was now being held at the Ras Mohamed marine park. But officials from the country's diving industry said they had photos of the shark responsible for the attacks on Tuesday and Wednesday - and it was not the same one. A search is still continuing, with boats and divers being deployed. Officials said they planned to release the shark into the open sea after capturing it. It is highly unusual for oceanic white tip sharks to attack humans, particularly this close to shore, our correspondent says. Only nine such attacks have ever been recorded worldwide. An expert from a shark trust in Britain suggested it might have been disturbed by illegal fishing, leading it to act in such an aggressive manner.